We said ‘goodbye’ to Fishie this week. Here is what happened…. Fishie is still doing well but how long can that last? Mrs. B is back from her trip. The girls swear they saw her car. Fishie may well be going home tonight. I am suddenly nostalgic for our time together. All those times she swam to the glass and waved her fins at me as if she knew I was like her temporary fish mother. Or the way she would pretend to be dead just to scare me then act all swimmy once she got the right amount of attention. I am going to miss that fish! No sign of Mrs. B. I will give it a couple of hours. Time to collect the big kids from school. I drag the three-year old to the door. She wants the stroller but we are actually on time today so I insist that we walk. We make it all the way to the corner before slipping in an enormous mud puddle (like a small lake!) and landing in a tangled heap in the road. One of us is crying. We scurry home to change into the closest clothes to the front door. Now we are late. Did she almost drown us in that puddle just to make a point….? We make it just in time to pick up girls and when we get home, the 3-year-old and I, still quite muddy, take a shower. I put on my nice flowery sundress with my new black flow-y top and feel much better. I should have killed her fish. I am throwing out this top! “Oh!” she says, like she only sort of believes me. She hands me the orchid. “This is for you. Thank you for looking after my fish. He is such a nice fish. Is he still alive?” she asks. “Fishie is fine. Great actually! I’ll get him for you right now,” I tell her. But no. Mrs. B says she has to go! The laundry repair guy is there, the rest is lost in the blur of her running away. “I’ll bring her over later today!” I shout at Mrs. B’s back. She gives a little wave over her head without turning around, and is gone. Tried and failed to return Fishie. Could have sworn I saw movement at Mrs. B’s house. The girls and I walked Fishie across the street, slow and steady, careful not to slosh but there was no answer even after 50 or so rings. Does Mrs. B not want Fishie? Our landlord visited today. He noticed the Betta and told me that he used to pet-sit for Mrs. B when he and his family lived here. My mother was opposed to pets of all sorts, especially Goldfish, which she considered to be ‘gateway pets’. She also had unruly hair that required frequent maintenance. The hair problem, combined with a lack of after school childcare, made it necessary for her to bring my sister and me with her to her hair appointments at the local mini-mall. To keep us occupied during her appointment, she would give us money for ice cream at the mall’s Dairy Queen. We would scarf down our ice cream then head to the pet shop where we could imagine that maybe one day, we would have a pet of our own. My sister and I were thrilled when we finally realized, after many hair appointments, that Goldfish are shockingly cheap. Armed with this valuable information, we came up with a scheme to finally get ourselves a pet. The next hair appointment, we got an ice cream as usual, but instead of getting fancy cones with sauce or toppings, we bought the cheap soft serves and pocketed the change. Optimistic from sugar, and rich with leftover quarters and nickels, we went to the pet store as usual but this time, we weren’t browsing. We were customers. Our newly coiffed mother was less than thrilled when she saw us with our plastic-bagged pet and our little container of flakes. Sadly, she was right. Our first fish died in its salad bowl within a day. But hair grows and mothers forget. Four to six weeks later, we got a new fish. It was a vicious and deadly cycle. I don’t know how many there were but it was more than a few. I mourned them at the time but otherwise haven’t thought a lot about those unfortunate fish since. That changed last week when a neighbour, Mrs. B, asked me if I would fish-sit for her, and those memories rose to the surface of my consciousness like, well, dead fish. “Can you watch our Betta?” asked Mrs. B. At first I was kind of excited. The girls would love to fish-sit. It would be like having a pet that we could return. Of course we would take the fish! Mrs. B told me she’d drop her off before they left. It wasn’t until later that day that the memories of my old pets started to surface and made me wonder if fish-sitting would be a mistake. A couple of days later, I returned from grocery shopping to hear delighted squeals coming from the kitchen. Our baby sitter looked like she had a headache; my children looked like they might burst with joy. The fish looked nervous. I didn’t blame her. “Did Mrs. B leave any instructions?” I asked. “Anything else?” I had told LoriLee that this fish business had me worried. “Nope. Just feed her. Bettas are really basic fish. You can buy them pretty much anywhere,” she added, confirming my fear that poor Fishie might bite it at any moment. It was then that I realized that Mrs. B had never actually said when she’d be back. Uneventful. Moved fish away from loud, pokey children to quieter spot on mantel. 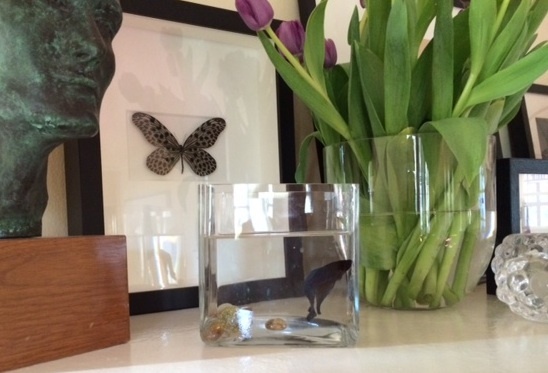 Fish swimming in glass vase. She ate her food. Seems happy. Children fight over who will feed fish. I decide that it should be me. I can’t risk them giving it too many pellets. Took kids to Cabrillo Marine Aquarium and saw many healthy looking fish. Feeling more confident about Fishie’s chances with our family. Took a walk on the pier and saw a caught but not dead fish being toyed with by a slobbering dog. Ominous! Allowed the girls to ‘rock paper scissors’ to decide who gets to feed the fish but controlled the process so tightly that everyone lost interest. Good! The small glass vase is starting to look a little dingy. Reminded of the quote from Benjamin Franklin about fish and house-guests stinking after three days. I realize that he didn’t mean fish that are actual house-guests but if that water gets any cloudier, he will be proven all too right. Called my sister to talk about the fish and ask her if she remembers or ever thinks about our former pets. “I didn’t realize that those fish had traumatized me for life. Fishie is bringing it all back. Anyway, her water is cloudy and I think I have to change it. It must be horrible for her in there,” I told my sister. How could I forget? It was one of the few that lasted long enough to need a fresh bowl. We’d filled the sink and dumped her in to wait while we cleaned. But the plug was leaky and the water drained out. The fish flopped desperately. My sister screamed. I scrambled for the tap, sick with horror. The fish lived that day but not much longer. I knew my sister was right. I hung up and checked on the fish. She looked a bit lethargic. Called my husband who also strongly advised me to leave the fish alone. Decided to go online and see if there were any suggestions about caring for a Betta. As expected, the internet turned up a trove of advice and information (mostly consistent!) and it seems that Bettas are hardier than Goldfish (i.e. as long as the water temperature is exactly right, they probably won’t die when you clean the bowl)so I decided to go ahead and change the water. I cleaned a square vase (like the one she came in but bigger) and added some room temperature water. It felt perfect. I was reasonably certain that it wouldn’t kill Fishie. Scooping her out was tricky (breath-holding/cold-sweat tricky) and eight year old was providing running commentary as well as ‘helpful’ advice. Fishie did not want to be in a ladle and was surprisingly hard to catch but eventually, she gave up and allowed the transfer. She seems to be doing okay now. Eight year old thinks Fishie is grateful for the fresh bowl but I doubt it. Repeatedly checked on fish. Caught her resting near the bottom several times and had to gently tilt the bowl to get her moving. She is doing well but may be a bit annoyed that I keep waking her. Allowed the three year old to drop four pellets into the clean bowl. All is well. But where is Mrs. B? I thought this was supposed to be short trip! Was going to cook fish sticks for the kids tonight but that seems insensitive. Fishie is disrupting our lives! 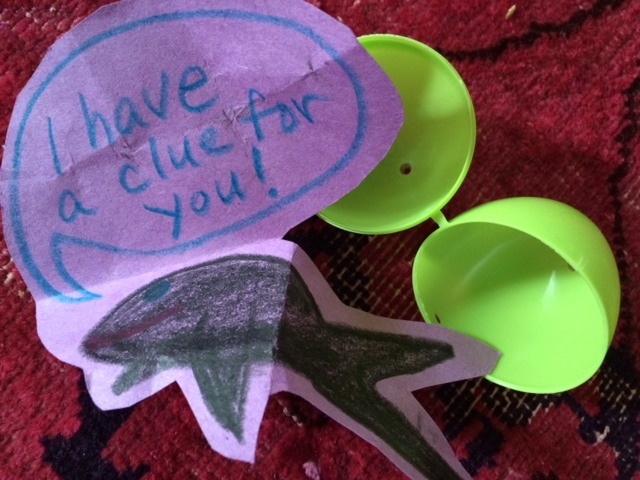 Fishie is alive and well and even participated in the Easter egg hunt. She has become a member of the family! I really hope she leaves before I have to change that water again. Still no sign of Mrs. B. When is Passover OVER anyway? The internet says it goes until next Saturday…. Nothing to report. Fishie is perky today and swims over to me when I check on her which I do almost as frequently as I spy out the window for signs of Mrs. B.
I hope this story has a happy ending! Fishie is still with us as both a house guest and a living being. My fish-care skills have improved significantly since childhood. Will change bowl later today….Unless Mrs. B shows up. Where are you Mrs. B??? 5PM: Fresh fish! Not quite seamless but second water change was much less traumatic for me and Fishie. Will be buying a new ladle and strainer after Passover…. For the rest of the story, look at The Fishie Report.